Click here for audio of Episode 210. Today, we watch two early not-quite-airplane flights. The University of Houston's College of Engineering presents this series about the machines that make our civilization run, and the people whose ingenuity created them. The name Maxim keeps coming at you when you study the history of technology. One reason is that Hudson and Hiram Maxim were two people -- brothers born in Maine in 1840 and 1853. The younger brother, Hudson, developed military explosives. Older brother, Hiram, invented all sorts of things, but he's best known for his machine gun. He worked for a good part of his life in England, and the English knighted him for his work. The first power[ed] flight of an Airplane was not, as many suppose, that made by Ader in France in 1897. 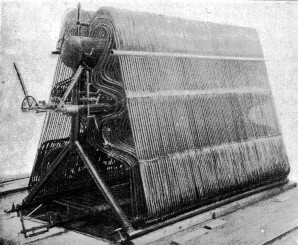 [It was made in] the large steam-powered machine designed and built by Sir Hiram Maxim. Now there's a shocker. Who's ever heard of the Ader and Maxim airplanes today! Yet we're asked to believe that the Wright brothers didn't invent the airplane. Well, the Maxim and Ader airplanes were real enough, and they both got off the ground. The catch is that we can't really ask, "Who flew first?" until we agree on what we're willing to call flight. The French builder, Clement Ader, built two wild bat-winged machines powered by steam engines. In 1890, the first one got a few inches into the air and skimmed the ground for 50 yards. The plane had a design flaw that didn't show up in that minimal flight -- Ader hadn't provided adequate control. But he thought he'd succeeded. He immediately began a larger version. When he flew it in 1897, it barely got off the ground and then crashed. Maxim invested £20,000 in a huge, 100-foot-wingspan biplane, in England. It was powered by two lightweight, steam engines that he'd designed for it. Each one generated in the neighborhood of 160 or 180 horsepower. 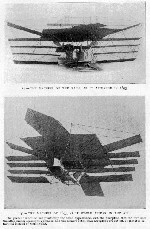 He began flight tests in 1894. On the third try he powered the plane up to 40 mph. It left its track, flew about 200 feet, and crashed. After that, Maxim lost interest in flying. He went on to other inventions. The 1890s were filled with failed attempts to fly, but Ader and Maxim came as close as anyone to success. Then the Wright brothers made repeated successful flights in 1903, but they rode on so much experience with failure. They were serious, clear-headed young men who methodically sorted out all the things that failure had revealed. We really should celebrate those daring people who failed and yet did not fail -- people whose flights of the mind eventually made flights of the body possible -- people who remind us that the worst failure isn't falling to earth. The worst failure is tying yourself to the ground without ever trying to fly. Roberts, E.W., Early Flight. Journal of the Society of Automotive Engineers. , Vol.II, No. 4, 1918. For more on Hiram Maxim, see Episodes 694 and 1357. This episode has been greatly revised as Episode 1738.